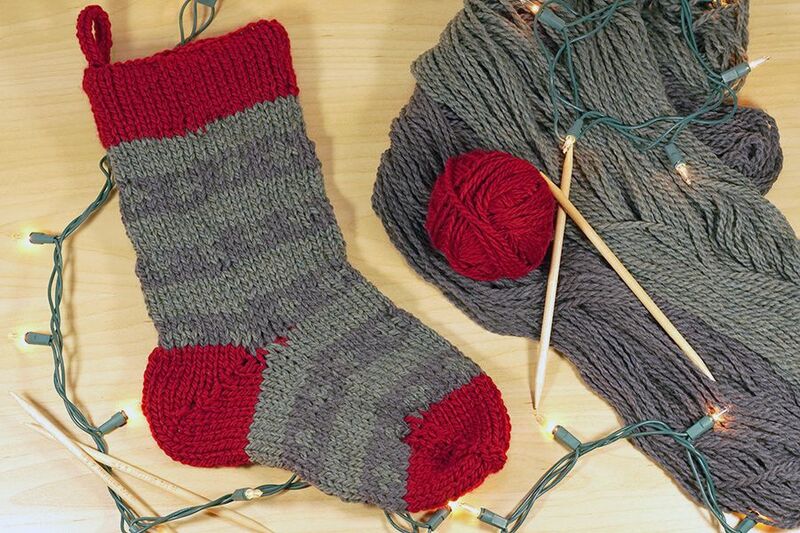 Hand knit Christmas Stockings are sure to bring warmth to the heart and hearth of your loved ones this season. 14 stitches and 7 rows to 4 inches in Stockinette Stitch on size 10 needles -- this gives a firm fabric, less likely to stretch out of shape. Cast on 40 stitches of Color B, spread out evenly across 4 size 10 double pointed needles. Join in the round. Knit 12 rows in Stockinette. Change to size 10.5 double pointed needles. The leg and foot of this stocking alternates between a solid stripe in Color C and a patterned stripe with Colors C and A. Change to C and work 5 rounds in Stockinette Stitch. Change to A but do not cut the yarn for C.
Carrying both colors along the wrong side, work the following pattern in Stockinette Stitch. Knit 1 round in A.
K3 in A, K1 in C, *K4 in A, K1 in C. Repeat from * until 1 stitch remains. K1 in A. *K2 in A, K3 in C. Repeat from * to end. Repeat these steps two additional times each. On the last row of the leg, only knit halfway. The heel is worked on 20 stitches at the back of the stocking. Shape the heel using short row shaping along half of the round, which is 20 stitches. Change to B and Knit to 1 stitch before the end of the round, wrap and turn. Purl to 1 stitch before the end of the heel, wrap and turn. Knit to 2 stitches before the end of the heel, wrap and turn. Purl to 2 stitches before the end of the heel, wrap and turn. Continue in this manner until 7 stitches remain in the center between the wraps. Knit to your first wrapped stitch, knit the wrap AND the stitch together by picking up the wrapped stitch from front to back. Wrap and turn. This stitch now has two wraps. Purl to your first wrapped stitch, purl the wrap AND stitch together by picking up the wrapped stitch from back to front and placing it over and behind the stitch. Wrap and turn. This stitch now has two wraps. Repeat in this manner until you knit across the entire heel. Be sure to knit both wraps when you get to them. Change to C and return to the stripe pattern. Work 5 rounds in Stockinette Stitch. Repeat these steps once more. Change to B and Knit 1 round. *SSK, K16, K2tog. Repeat from * until end. *SSK, K14, K2tog. Repeat from * until end. *SSK, K12, K2tog. Repeat from * until end. *SSK, K10, K2tog. Repeat from * until end. *SSK, K8, K2tog. Repeat from * until end. Use the Kitchener Stitch to connect the stitches on needles #1 and #2 to the stitches on needles #3 and #4. Fold the cuff along the purled row toward the inside of the stocking and sew from the wrong side. Knit a three stitch i-cord approximately 5 inches long. Bind off, shape into a loop and sew into the cuff.